We review a lot of cryptocurrency exchanges on Coinlist.me, and each time we try to point out 1) the quality of the exchange, and 2) the cryptocurrency user population that would get the most benefit from it. GDAX is an interesting case. You’ll be hard put to find a better exchange, with more elegant trading features, and lower fee prices. However, GDAX is not well-suited to new users as a simple platform like eToro would be. In this GDAX review, we’ll highlight the differences between GDAX and eToro, then deal with GDAX on its own merits. If you’re new to cryptocurrency trading, you may not be ready for GDAX just yet, but we’ll see that you get pointed in the right direction regardless. If you are an experienced crypto trader, however, GDAX may be the perfect exchange for you. GDAX is owned by Coinbase, the world’s most popular crypto-buying option. Coinbase is sometimes called the Facebook of crypto exchanges. It’s easy to use, decked out in calming white and blue, and prepared for the masses. Like Facebook, it offers an intuitive service not quite like what they can find anywhere else, but also like Facebook, users sacrifice something when they use Coinbase. Coinbase offers cryptocurrency purchases (Bitcoin, Litecoin, Bitcoin Cash, Ethereum) only at a single market price. The coin simply costs what it costs when you buy it. On most other exchanges, users can buy at specified prices set by the sellers and buyers associated with each transaction. By using only the market price (for simplicity), Coinbase users leave potential savings on the table. Coinbase users also pay high fees for transactions – a base rate of 4% (!!!) for US-based payment methods. It’s true, using Coinbase’s preferred payment method, the fee is lowered to 1.49%, but that’s still a hefty sum all the same. GDAX, meanwhile, doesn’t spoon feed its users. Instead, it offers complex trading options and performance for sophisticated traders. The layout may be terrifying to a newb, but the design is actually top notch when compared to other industry options. What’s more, GDAX charges way less than Coinbase, and allows users to make orders that could save them tons of money when compared to Coinbase. Buy orders start at 0.30% and can be volume-discounted down to 0.10%. Sell orders are free. We like GDAX exchange quite a bit, but we admit it’s not for beginners. Options like leverage and, really, anything departing from a simple market order can result in financial catastrophe for unexperienced users, so before we dig into the nuts and bolts of GDAX exchange, we want to offer eToro as a better option for beginners. eToro is the height of simplicity. Rather than offering users traditional asset-ownership investment (user buys coins, sends them to personal wallet, stores them on personal device), eToro lets users get all the profit of cryptocurrency investment, without the responsibility of asset ownership. Instead, eToro deals in CFDs. A CFD is a Contract For Difference. Basically, you deposit money and buy as much Bitcoin (for example) as you can afford. You don’t own this Bitcoin. Instead, you own a contract to the profits associated with this Bitcoin, if it were to raise in value. Let’s say you bought 1 Bitcoin CFD for $9,400 (Bitcoin’s price at the time of this writing). If the price of Bitcoin went to $10,400 the next week, you could close your contract and pocket the profits. Easy peasy. This is a great option for most new cryptocurrency users because most of us are investors, not users. Most people reading this article want to own Bitcoin because they think it’s going to go up in value, not because they want to spend it. If that’s you, you don’t really need the traditional asset-based service model offered by GDAX exchange and others. CFDs will work fine for you, and eToro is way easier to use for new account holders than GDAX. If, however, you do want to learn the ropes of a complex cryptocurrency exchange, GDAX is one of the best. We’ve described GDAX exchange as complex, but it’s really not so difficult to understand. New users just need to be careful to make sure they understand everything before they trade, because a mistake can cost you on a professional exchange like GDAX. Start by creating an account. You may be surprised to find out that you already have one. If you’ve ever used Coinbase, your login for Coinbase works with GDAX, and funds can be transferred from Coinbase to GDAX with no fee. This is because Coinbase and GDAX are the same company – two different user interfaces, sharing a single back end. If you already have a GDAX account, cool. If not, go ahead and create one. Now let’s take a look at the GDAX exchange user interface. It may look a little complicated to new users, but each of its composite parts are pretty easy to explain, and we’ll cover them all. Let’s start on the left of the screen with the Order Form. Note: We’ve selected the BTC/USD trading pair, so all of the information on this page will correspond to exchanges between Bitcoin and USD, in both directions. At the top of the order form, you’ll see options to Deposit and Withdraw. You can link your bank account and deposit cash with which to buy Bitcoin. You can also deposit Bitcoin, which you can then trade for USD (or other supported fiat currency). This is commonly known as “cashing out”. Market Orders: This is the simplest order type, and it’s the only type of order offered through Coinbase. Basically, a market order is when you buy a coin right this second, for the best price available. If you just want to get Bitcoin (or the other coins offered on GDAX) and don’t care so much about the price right this second, the market order is for you. Limit Orders: Limit orders are a little bit more complex, in that they give you the option to choose the price you would like to pay for Bitcoin. Say you’ve been watching this incredible recent Bitcoin price increase that we’ve been enjoying at the end of April 2018, but you think it’s going to dip before going up again. You might set a limit order at $8500. This order would only be filled if the price actually went that low (at which point it would hit your “limit”). Limit orders are a way to get the best price, if you’re willing to wait. Stop Orders: Stop orders (sometimes called Stop Loss orders) are a way to prevent the loss of your wealth in the event that Bitcoin totally crashes. Bitcoin has had several crashes in its history, most recently in January 2018 when it lost well over 50% of its value. People who had stop orders in place were able to sell their positions as the price tanked. Stop orders fulfill automatically, only if the price dips to the amount you specify. In a way, it’s just like a limit order, but for sellers instead of buyers. Next to the order form, you’ll find the order book. You don’t technically need to pay attention to this information to make a trade, but it’s interesting information valuable to professional traders. The numbers in red correspond to Sell orders currently available within GDAX. The price closest to the middle is the sell order asking for the lowest price for Bitcoin. Prices increase as you move further up the stack. The prices in green are Buy orders. The buy order at the highest price is listed at the top, with orders at cheaper prices descending from there. The Buy and Sell orders that meet in the middle will always be very close in price, and as such these orders will be completed quickly. You’ll see these numbers decrease and disappear as these orders are filled. Beside larger orders you’ll see a rectangle, with size corresponding to the size of the order. Someone trying to buy 50 Bitcoin will have a big green rectangle, while someone trying to sell just 0.64 Bitcoin will have a tiny green rectangle. This section contains two different charts, which both provide valuable information for understanding the present price of Bitcoin, as well as its potential for the near future. The top chart is a normal candle chart. You can see these on any platform that deals with stocks. Each candle represents a set unit of time – 5 minutes in our chart. You can set this to 1 minute, 1 day, 1 week, 1 hour – whatever’s most helpful to you. A green candle means that, during that specific 5 minute timespan, the price of Bitcoin increased. More specifically, the price of the final order at the end of 5 minutes was higher than the price of the first order at the beginning of the same five minutes. Red candles are just the opposite. They mean that during a five minute period, the price finished lower than it began. For green candles, the bottom part of the solid section of the candle represents the first order of the time period. The top section of the solid portion of the candle represents the price of the final order of that time period. The “wicks” above or below the candle body represent prices above/below the starting/finishing price. These prices might have happened within that 5 minute timespan, but they’re not represented in the solid candle body because they weren’t the first or last order. The chart below represents the current open Buy and Sell orders on the books. Green = buy, Red = Sell. Steep “walls” represent single orders for lots of bitcoin. Observed as a whole, each pile of orders represents the total value of all buy or sell orders. If the green side is bigger/taller, it means that more people are trying to buy than sell, at least as the prices represented. If you scroll out by hitting the minus (“-“) button to the left of the price, you can zoom out to see all orders, not just the ones at prices near Bitcoin’s current value. These might tell a larger story about market sentiment, but these orders are so big/small that they won’t be filled anytime soon, so you can usually ignore them. The rightmost column is a list of all of the most recent buy and sell orders that were completed, in order, starting with the most recent. This is a good way to visualize recent trends and buying/selling opportunities. So there you have it. 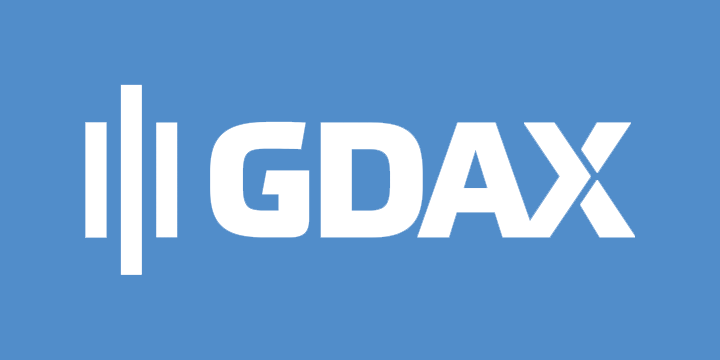 GDAX exchange is a high quality cryptocurrency exchange for cryptocurrency traders with a little bit of experience under their belts. Because new users may find it challenging, we recommend eToro as a way of getting into crypto fast, without the risk and responsibility of digital asset ownership/management. However, eToro is not available for American users, and may not meet the needs of every beginner. GDAX is owned by Coinbase, and in many ways is the same exchange. The main difference is the interface and the amount of choices afforded to GDAX users. Another significant difference is the fees, with Coinbase starting at 4% and GDAX starting at just 0.30%. This is because Coinbase does all of the work for you, while GDAX requires its users to have some skill. GDAX only sells Bitcoin, Bitcoin Cash, Ethereum, and Litecoin, but if you’re in the market for those coins and are willing to learn the ropes, GDAX can be a great experience that will make you a better trader.